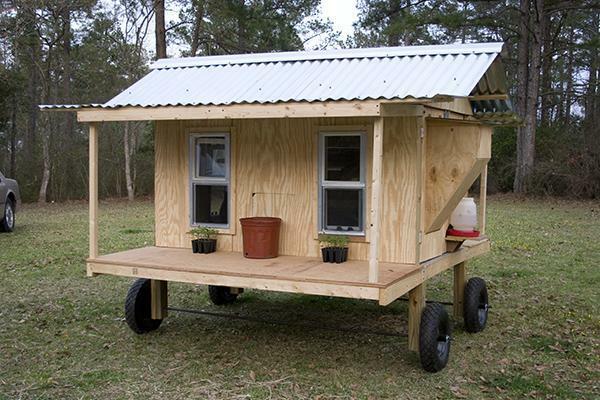 Hey guys, I just finished my coop design and I am excited to show you. And I want to give credit to Jarhead for the ideas. I really liked his plans and modified them a little to get the coop I was shooting for. 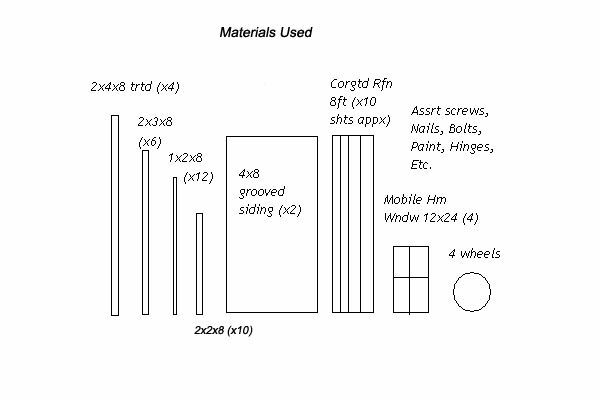 As you can see it is a simple 2x4 and 2x3 construction along with 2x2 and 1x2s where I wanted to save on the final weight of the tractor. 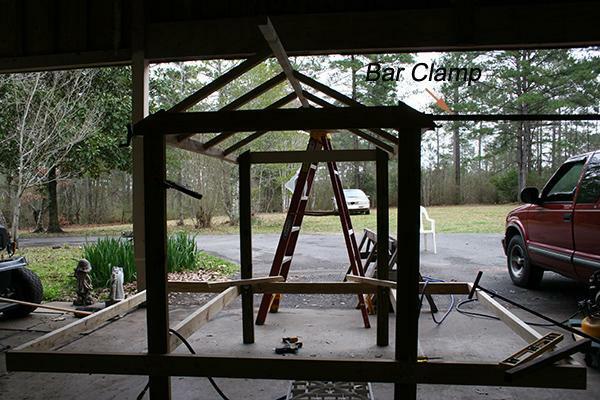 The bar clamps were a huge help in snugging up the joints. I would of course recommend them for a lot of projects. This one is 3/4" galvanized pipe about 8-10' long. I also used 24" clamps as well. 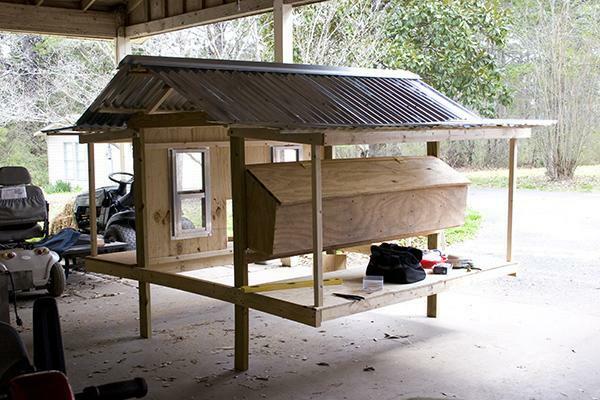 I planned for a "porch" on the front and back to immulate the old style cajun homes sometimes found in Louisiana. This next shot is the second phase and shows the roof, nesting boxes, and front windows installed along with the porches. Here's a photo of the interior showing the boxes and the basic construction approach. The 1/2 hardware cloth floor has not been installed yet so the roof could be reached more easily from a ladder. Notice the nesting boxes are pitched back slightly. Not shown is a 1/2" gap at the rear of each box to allow water to drain out when spraying out with a water hose. The next pic is an innovative idea I came up with in order to get the cutout for the waterer. 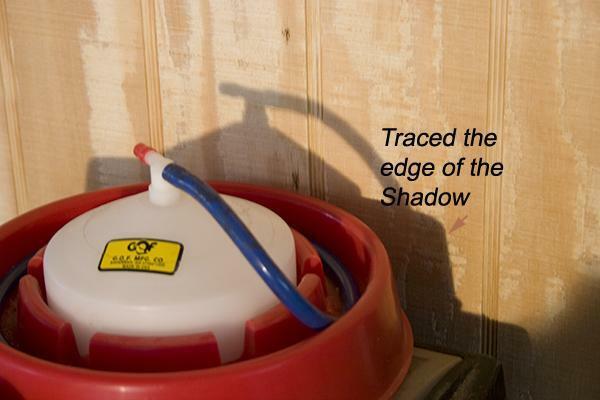 I set a shoplight up and simply traced the shadow of the waterer on the door. After I cut it out, I put a small shelf (shown later) to keep the waterer outside and maximize the interior floor space. Here's the unpainted project completed with wheels attached. You can see the gravity feed bin is attached outside as well, to maximize the interior floor space. As mentioned above you can see the waterer is outside and sits on the shelf. We are currently using the "jug" type waterer and plan to switch over to the auto-waterer soon. The wife put some future tomato plants under the windows to give the girls a touch of home. The large planter keeps the pop door from being pushed out (it's also temporarily stapled in place) while we build the run. Next shot shows me and the goat chilling with the peeps on a gorgeous 74 degree day. The wife named the goat "Butterbean". This one shows the run attached to the coop. Incidentally the run is also portable via wheels attached to one end. The opposite end is picked up with the three point hitch on a Kubota tractor and pulled to its next location in the backyard. 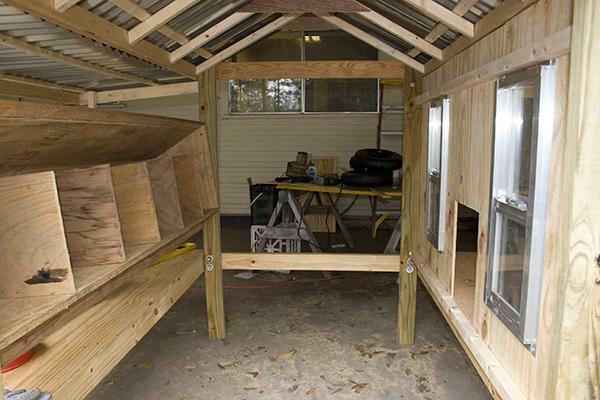 The coop is then moved into place next to it, and the pop door opened for the ladies and one roo. The next shot shows how the porch roofs' pitch (say that three times real fast) can be adjusted to allow runoff. Terrain does not always accomodate the shallow pitch I used on the porches' roof. 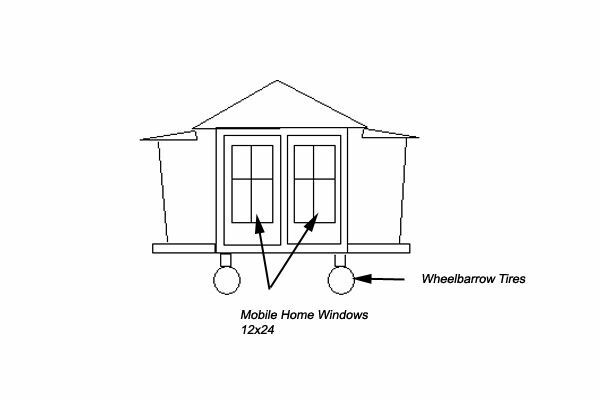 You'll also notice where the porch roofs are attached to the main house there is a single "bolt-hinge" that allows me to slope the porch roof more when the ground doesn't give me enough run off during heavy rains. It's March 16th and if you followed the weather channel you saw where we just got a 4-day rain maker that dropped 4" on us. We had to drop the tarp we use for shading and hawk control inorder to keep it from tearing. You also see we painted it. 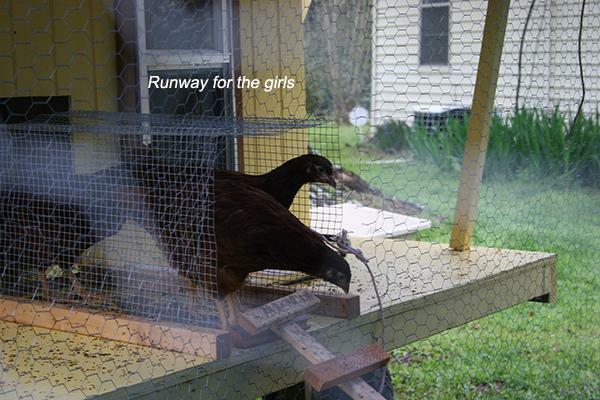 Here is a shot of the girls exiting the "runway" from the coop to the run. It's simply hardware cloth folded to make a small "hallway" for them to walk from the coop to the run where they can strut down the ladder to enjoy some pecking and leg stretching. Here are some basic (I mean really rudimentary!) 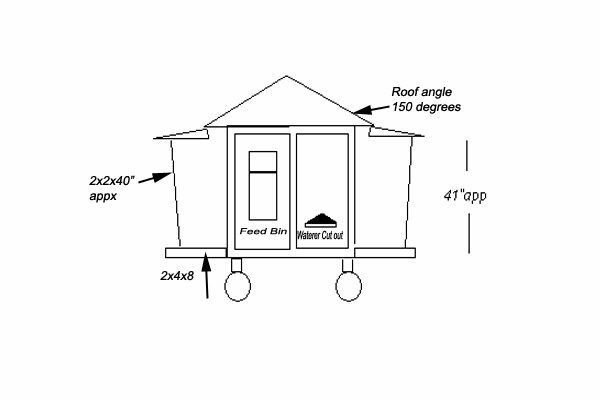 plans for the coop. Overall, it's an 8x8. The floor is a 6x8 with the roof sticking out 12" on either side beyond the floor width. The actuall living area is 4x6...24 sqft. 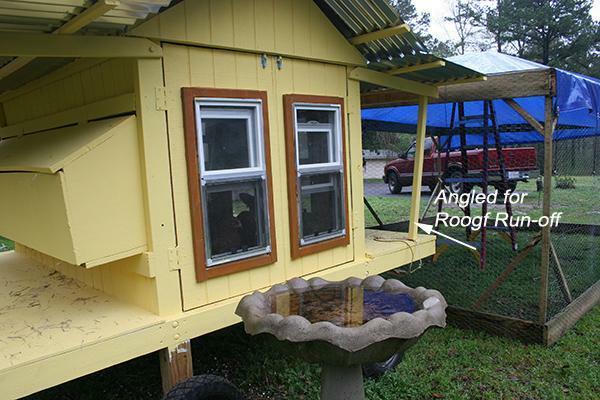 There are 6 nesting boxes, and 2 four foot roost that also add to the sqftg. I am glad to finally be through with the project. It was a lot of fun. MotherOfPeepPeeps and krizrose like this. "Nice pics, details, and sketches!" I love the design and the large wheels! nice coop love the runway! I hope you don't mind I used a lot of your ideas blended with a few of my own, to make my own rendition of yours. I'd love to see a pic of your nest boxes. 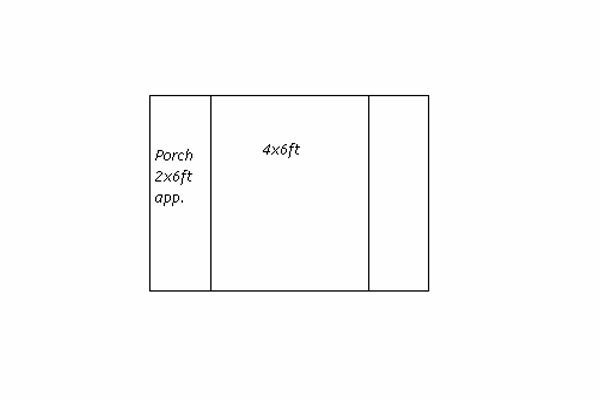 I have a few doubts on my original thought of the boxes, so for now I'm stumped. Love the coop it's really awesome. what a great coop! i agree, i'd like to see inside too the ladies sure look happy, no fighting over windows! i love the porch/tail gate all in one ! and the runway... and the yellow! Oh man, that is just too rich. I would also love to see the inside. Thanks so much for posting it. Do you have a picture of the finished inside? With the doors open to see the roosts, boxes and the feed bin? Do you get much cold winter and snow? I am wondering if it needs to be insulated for -20 to -30 we get on occasion here and snow in the winter? 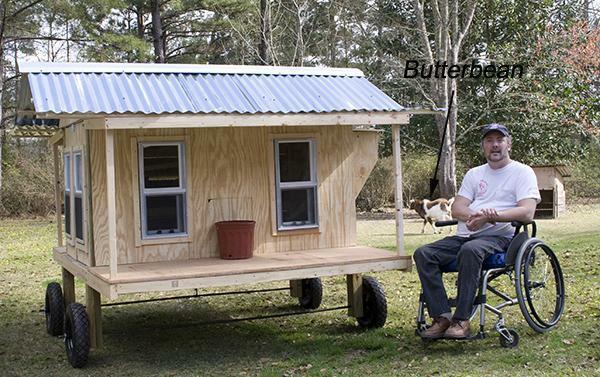 That's a really great-looking coop; I'm sure the girls love it. I like all the windows. I guess they open, too --- a nice cross-breeze. 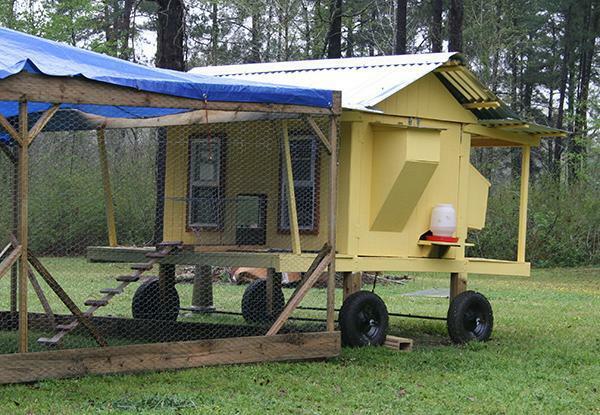 Love the coop, like the nice beg wheels. & being able to pull with tractor of something is a real bonus.